The Twin in Berlin: I WILL BE BACK When She And Her Husband Are Sealed In The Temple....Mark My Words. I WILL BE BACK When She And Her Husband Are Sealed In The Temple....Mark My Words. Ja, das habt ihr richtig verstanden. ICH WERDE VERSETZT!!! YES YOU READ THAT CORRECTLY I AM GETTING TRANSFERRED!!! Second dramatic reveal.... Elder Clarke as my district leader!!!!! Haha when Elder Schaal said that when he called, I was CONVINCED it was a joke. Only the fact that he is German and pretty straight forward helped me take it easy and accept it. BUT I AM SO STOKED. We were together before Sister Brim came, and it feels like just yesterday I said goodbye to her. Haha, it is about to get CRAZY in Leipzig!!!!!!!!!!!!!!!! Anyway, let's keep it real. I leave tomorrow morning at 9 43, to Hamburg, then I take a fancy ICE to Leipzig. woohoo!!!!!! Also HAPPY BIRTHDAY ZACHYYYYYYY LOOOOVE YOU PRECIOUS BROTHER. I bet you are on day..hmmmm 4 of partying??? ;))) Miss you and wish you alles gute mein bruder!!!! Germany.... The weather here is very sunny one day, then cloudy the next. Not too cold, I go ohne jacke now. German food is probably the best thing I have ever had. The bread, pudding, and joghurt are best, to give you a few examples. I think I will have to start a food diary or something!! MY HEART BELONGS TO ROTKOHL. Yes, as you read above, I am getting transferred to Leipzig. mal schauen. The church is still waiting for apple to deliver the ipads!! The church will own the ones we'll be using, so they won’t be officially ours, thus we don't have to pay. Best thing? How much time do you have (indirect reference to sleepless in Seattle anybody???) Every day this week was pretty solid! Wednesday we went to Kiel for our ztm!! SISTER HARRIS FOR THE LAST TIME. That was bittersweet, but she will go home and DO WORK. 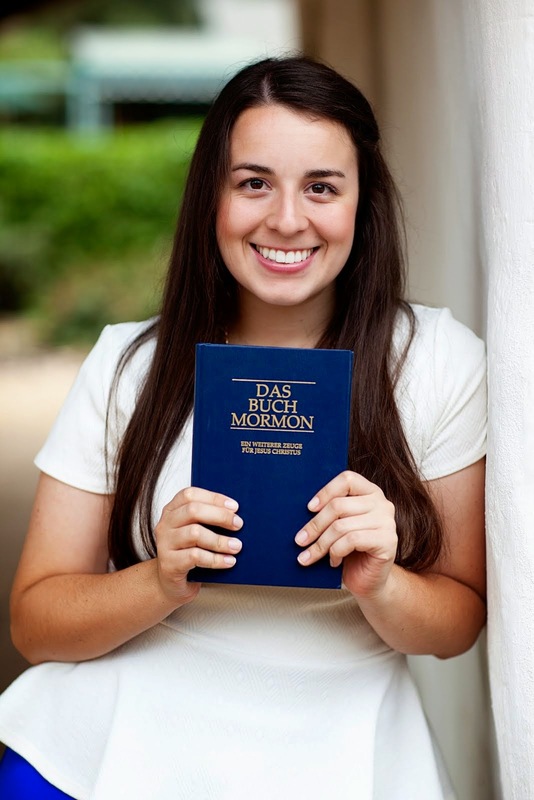 I love her :) She and Elder Peterson, one of the elders serving here in Lübeck, both gave their "finisher" testimonies. I cried. They are both solid missionaries!! They will be missed. Wednesday night we ate this bremen specialty food at the Devers. DELISH. haha some mixture of meat and potatoes, with pickles, red beets, and fried eggs on the side. waaaay bremen and waaay goood. Thurs we went with the elders to a family in the ward to help them take wallpaper off their walls, and then THEY GAVE US THE BEST MEAL I MAY HAVE EVER HAD. Let me tell you. Steak (its been toooo long) wurst, weißkraut, kartoffensalat, bread, nudelsalat, and this mousse thing for dessert. SO GERMAN AND SO GOOOD. Freitag we went to a lady in our ward, who took us to her somewhat interested in the church friend, who has this cooool garden. Then she made us dinner back at her place and told us cool things about her conversion, and staying strong in the church. Solid. Yesterday was my last Sunday here in Lübeck!! This was also the hardest part I think, saying goodbye!!!! I love this ward and area so much!! I am sad to leave. Mensch the people are just too cool!!!! Right before this, we were at Schwester Devers. I shared D&C 127:2 with her, and 2 Corinthians 12:10. it is and will be hard, but she is doing it!!! I shed a few tears. But I WILL BE BACK when she and her husband are sealed in the Temple....Mark my words. It is only goodbye for now. LOVE HER. With new beginnings approaching, I would like to share the scripture in 3 Nephi 13:34. (Please take a moment to find and read) As humans we naturally have MANY things about which we can worry. But I don’t want to spend too much time worrying about tomorrow, so that I cant even focus or enjoy today. I want to look forward to the future!! For me, my "worry" is this next transfer in a new city. But I know that Heavenly Father is looking out for me! Er sorgt sich um mich!! (I think it sounds better in German) I know that as long as I do my part and try my best and TRUST HIM, He will make everything ok. He will fill my heart with peace, and joy to love every moment that life brings :) Whenever you think of your next "worry" think of this scripture. He is mindful of us, He is always there. He will guide us. I know it.